$100,000,000 is at stake in this competition to discover a formula to predict tornado touchdowns. But when equipment starts failing and crew members are injured, you as Nancy Drew, must join the team to keep them in the competition. Is it just bad luck that's plaguing the storm chasers or is someone sabotaging their chances of winning in the action adventure Nancy Drew: Trail of the Twister? Nancy Drew®: Trail of the Twister is a first-person perspective, point-and-click adventure game. The player is Nancy Drew and has to solve a mystery. Explore rich environments for clues, interrogate suspects, and solve puzzles and mini-games. 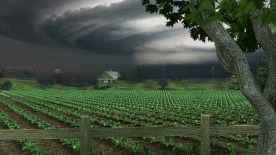 Play as Nancy Drew and go undercover as a storm chaser. Immerse yourself in meteorology by studying clouds, reading Doppler data, and surviving tornadoes. Collect pennies by playing arcade games to purchase candy from the store. Copyright © 2010 Her Interactive, Inc. HER INTERACTIVE, the HER INTERACTIVE logo and DARE TO PLAY are trademarks of Her Interactive, Inc. NANCY DREW is a registered trademark of Simon & Schuster, Inc. Licensed by permission of Simon & Schuster, Inc.